The first cars to support CarPlay will debut at the Geneva Motor Show this week, coming from Ferrari, Mercedes-Benz, and Volvo. They'll be followed by a very broad range of carmakers: Nissan, Peugeot, Jaguar Land Rover, BMW, and General Motors are among the big names promising to integrate CarPay into their forthcoming vehicles. Ford, which was recently reported to be moving away from Microsoft's Sync in-car voice commands, is also among the roster of future CarPlay supporters. There are still far too many unknowns about the product. We know that the service is only compatible with phones that have the lightning connector. What about iPads? Will the service use the lightning connector, or will bluetooth be an option? Will it be an expensive, BTO option when buying a new car? How much. What if you buy one of these cars but use something other than iOS? Apple has confirmed the product. But so far, all we have is some new marketing speak and journalistic speculation. Speaking of which, I have a bit of speculation of my own. This product is causing the people at Microsoft, Google, and Blackberry to pull double and triple shifts to catch up. Microsoft has had an exclusive partnership with Ford for a long time with this type of product. Just last week it was reported that the long-standing relationship is over. The Microsoft product was too problematic, and was unceremoniously dropped. Blackberry cheered over the news as it was reported that Ford would be moving to QNX: a company Blackberry bought a few years ago. Shortly afterwards, it was reported that the QNX angle was not true. Now we learn that Ford is on the list for CarPlay. That kicks both Microsoft and Blackberry right in the tenders. In typical fashion, Google has also announced an in-car initiative. Obviously, they do not want to be left behind in the roadrageous battle for automotive supremacy. I'm also thinking we can expect Samsung to launch their own initiative apart from Google. Again, Apple is not the first to this market. But they will be the ones to reinvent it. Seeing how Apple does it, everyone else will quickly fall in line with a me-too product. 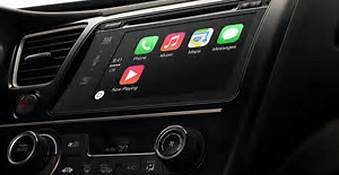 As in every other market, expect Apple to dominate the high-end of the automotive range. For now, this story is not yet interesting. I'll let you know when it really starts to rev up.